Please wait while your browser fetches the current weather. This may take a couple of seconds. 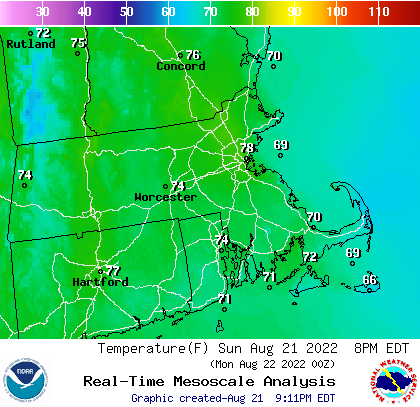 Cape Cod weather is provided by CapeGuide.com, a part of the c4.net network. Add the weather to your Web site. Please wait while your browser fetches the tides and currents. This may take a couple of seconds. Cape Cod tides and currents are provided by CapeTides.com, a part of the c4.net network. Visit CapeGuide.com for information about Cape Cod, Martha's Vineyard, & Nantucket. Add the tides to your Web site. The following is the 7 day weather and marine forecast for the Nantucket, MA area. This Information was last updated Tuesday, April 2019 at 12:41 AM. These forecasts are provided by NOAA. Winds from the North East. 5 to 10 knots. Gusts up to 20 knots this evening. Seas 4 to 7 feet. Patchy fog. Showers this evening. A chance of showers after midnight. Visibility 1 nautical miles or less. Winds from the South West. 10 to 15 knots with gusts up to 25 knots. Seas 3 to 5 feet. A chance of showers. Winds from the North West. 10 to 15 knots with gusts up to 20 knots. Seas 3 to 5 feet. Winds from the West. 5 to 10 knots. Gusts up to 20 knots in the morning. Seas 2 to 4 feet. Winds from the South. 5 to 10 knots. Seas 2 to 3 feet. A chance of showers. Winds from the South. 10 to 15 knots with gusts up to 20 knots. Seas 3 to 5 feet. A chance of showers. Winds from the South West. 10 to 15 knots with gusts up to 20 knots. Seas 4 to 6 feet. A chance of showers. Winds from the West. 10 to 15 knots with gusts up to 25 knots. Seas 3 to 5 feet. Winds from the North West. 10 to 15 knots with gusts up to 20 knots. Seas 2 to 4 feet. Seas are reported as significant wave height, which is the average of the highest third of the waves. Individual wave heights may be more than twice the significant wave height.